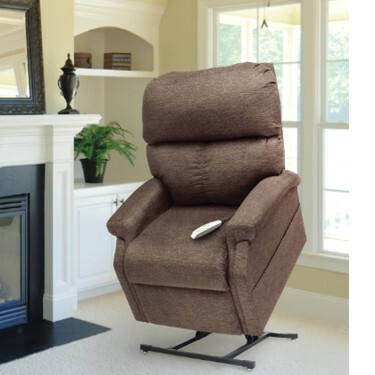 Relax, worry-free, in the Pride Mobility Classic Collection Power Lift Recliner (LC250). This super-comfortable and practical power recliner helps you get out of your seat safely without exerting too much effort, and features a range of handy and stylish finishes that make it a practical addition to your home. This Pride lift recliner is equipped with comfy, over-stuffed fiber-filled backs and comes in a range of exquisite colors to match your particular d©cor. What's more, Pride lift recliners are made with a patented, smooth and quiet operation system featuring a heavy-duty lift actuator and scissor mechanism, plus integrated battery backup. Parentgiving is happy to help you customize this lift chair recliner with a cleaning kit and other great extras! Note that all Pride chairs from Parentgiving require a signature upon delivery. We can help you get your new lift chair set up in no time at all. Be sure to reference the Pride Lift Chair Position Guide or the Pride Lift Chair Owner's Manual at Parentgiving. Top of Back to Seat: 18"